Yesterday we had a pool party with a a few friends from the gym. It is our favorite summer activity! We played ladder ball, washers, and this time added bean bags to our collection of poolside games. It's always nice having people over who also eat Paleo. A party would hardly be complete without spinach dip. The avocados are a nutritious creamy substitute for the dairy ingredients that are normally found in spinach dips. By replacing the chips and bread with refreshing jicama chips, you can still savor this Paleo-friendly spinach dip at your next gathering. 1. Defrost the spinach in a microwave-safe dish. Let it cool and squeeze out the excess liquid. Add the avocados to a food processor along with the Paleo mayonnaise. Blend until smooth. Break up the beef bouillon cube and sprinkle it into the food processor, along with the onion powder, garlic powder, and red pepper. Pulse the food processor until the seasoning is completely mixed in. 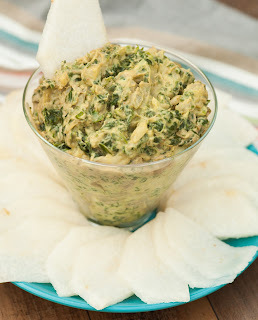 In a medium bowl, stir together the avocado mixture, spinach, artichoke hearts, onion and lemon juice. 2. To prepare the jicama, either peel or cut away the skin. Slice it into ⅛” rounds then cut the large rounds in half. Serve alongside the dip. Looking so delicious and tasty one.